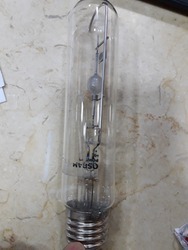 40 watt T-25 long 125-130 volt E14 cap-base clear 1000 hour universal operating position appliance cooker hood tubular incandescent light bulb - also it has been use by chimney manufacturer. WE ARE THE SUPPLIER FOR Tubular Lamps Enclosed Rated. We provide a series of high efficient metal halide lamps made with an accurate design. These are durable, free of defect, and have the capacity to resist the defects. Our range of metal halide lamps resist heat and corrosion. We are the leading manufacturer and service provider of Tabular Lamps which has a faster warm-up and hot re-strike features. This range is available in wide range of watts colour temperatures. These have a superior lumen maintenance and retroit versions for HPS/HPMV Lamps. Our product range is also available from 70 -1000 W.
Matching up with the ever increasing requirements of the customers, our company is engaged in providing High Pressure Sodium Tubular Lamp.